Andrei Rublev is the most famous Russian icon painter of the Moscow school, whose creations are admired by art lovers and specialists all over the world. Master of monumental painting of the 14th century, Rublev was a great historical and cultural figure, which is still surrounded by legends and myths. Around the year 1408, Rublev writes the Apostle Paul, one of two icons of the Deesis rank. 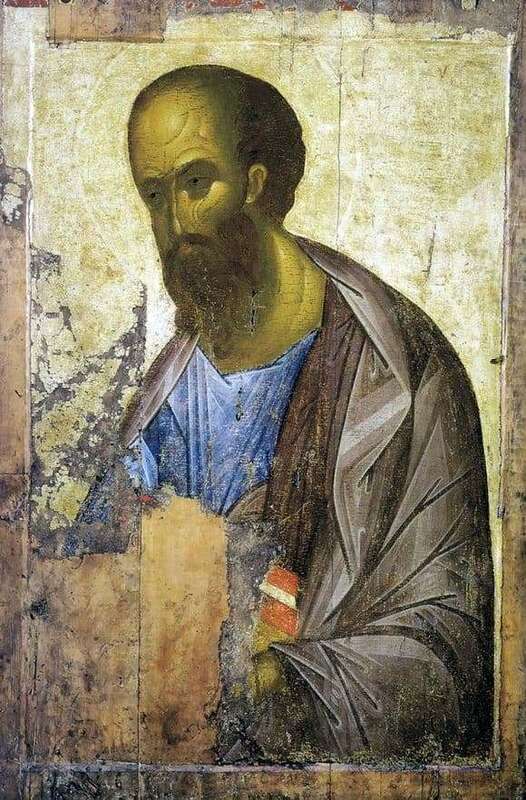 The second icon was the image of the Apostle Peter, similar in style and technique to this work, which pushes the idea of ​​their common author. The history of the apostle Paul is confusing, but is known from the Scriptures. A man named Saul, a Roman of Jewish origin, was known for his persecution of Christians. He was blinded by an unearthly light, after which God appeared to him and instructed him on the right path – struck by this miracle, Saul ceases to persecute Christians and, instead, joins them. Rublevsky Apostle Paul is a hero immersed in a deep thought. In his hands is a book (the image was lost over time), as a symbol of wisdom and knowledge, and most importantly – the preaching of Christianity. After believing, Paul was healed and baptized, which allowed him to devote his whole life to preaching the Christian faith. Total left behind more than a dozen messages. It is not surprising that Rublev depicts such a figure with a special interest. Paul’s gaze is not directed at the viewer, he looks away and ponders over higher thoughts. This icon becomes an example of Rublev’s skill. The figure is spelled vigorously and clearly, typical of the master. The clothes of the apostle are dark, in color matching the canon, and with deep folds written in them. Paul’s entire face shows the hero’s inner strength, his conviction in his own faith, and the importance of the wisdom of thought. This icon is located in the Assumption Cathedral, in Vladimir, where Rublev worked for a long time.